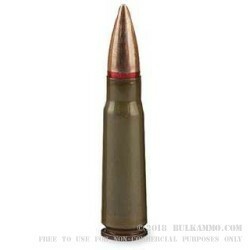 A simple, 7.62x39 target round for those who don’t need or want the hollow point version of this load. This particular variant is a 124 grain FMJ copper clad projectile in a steel lacquer coated case that is made very closely to the military surplus rounds. Rounds that were made famous for American shooters in the 1980’s and 1990’s on the tail end of the cold war. At this time, when many of the Russian and Chinese and Eastern Blok rifles were coming into the market here along with the dirt cheap ammo that was accompanying it - we developed an extreme appetite for it. As the regulations for imports tightened and much of the supply either went into hoarded ammo closets or was shot, the corrosive ammunition dried up. 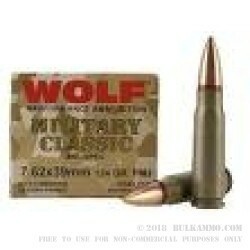 Wolf Ammunition has re-released the military surplus version with a 124 (not the original 123) grain projectile in it as a FMJ payload. This is that round, without the corrosive primer/powder. The subsequent success of this round has shot through the roof, with this being one of the best versions of the venerable 7.62x39 cartridges on the market. Simply put, this is exceptionally reliable, functional ammunition that offers good accuracy, and a fantastic price point. It will function in any 7.62x39 firearm. This is a full, bulk 1000 round case of 7.62x39 ammunition. It comes packaged in two 500 round sealed packages with the ammo ready to fire in your AK-47 or other 7.62x39 chambered rifle.